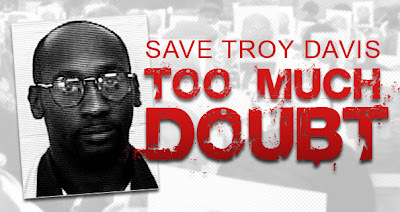 KayKiSpeaks.com: Sparing Troy Davis' life IS POSSIBLE! These people are a distraction to those of us trying to get the word out. They are using ignorant responses & lies to convince us social media campaigners that we are acting in vain. Well, Id like to say that we are NOT. It is the mere audacity to spread the word/speak/tweet about an issue that can change the course of someone's life-literally in this case! The information is what people need. Some times just one piece of it can ignite a fire in the right heart at the right time and something will be done. If tweeting is someone's way of spreading the word of injustice then let them ACT! Ive read today on twitter that we are, "wasting our time." that, "Its too late anyway, why did you wait until now!?" along with many other ludicrous statements from seemingly ludicrous people. I want to encourage my tweeters & facebookers that your voices and actions are not in vain. If it were you or your family member you'd want your name tweeted to as many people as possible. Come on guys. This is the day where CNN goes to twitter to see what the people are talking about. In this case, what we are asking for is not impossible. The voice of the people on twitter is simply asking for Mr. Davis' life to be spared! This is absolutely something that can happen! There have been cases where stays were granted. One in particular even up to hours before execution. Take Robin Lovitt for example. Lovitt was set to be executed in Virginia on July 11 at 9pm in 2005. His stay was granted at 4:30 pm that same day due to conflicting evidence!! Sound familiar? The evidence in Troy Davis' case is definitely lacking. We are asking for that to be considered. Even though Georgia's Governor has no power to stay executions, this still tells us that something can be done! I was presented with many questions today as to why Im campaigning on twitter, or how I know he is innocent. Or why I waited until today. Unfortunately it really did sneak up on me. I was informed of this case a year or so ago while researching information to help fight my own brother's case of wrongful conviction. As for Mr. Davis' innocence though, I dont know if he is or not. That isnt my concern. It is unfortunate that SO many are missing the point. This man's life is about to be taken. There is a bigger issue here even if he is guilty. To kill someone for killing someone is just insane. We can not stand by & quietly watch some one's life be taken by a system that has proven over and over again that it is flawed. It is not always accurate, and when it is not accurate for one it is less accurate for all of us. You are in fact affected by this Troy Davis case. You may not see it now because you choose not to, but this could very well hit home sooner than you think. These people signing pieces of paper and holding meetings to decide to inject Mr. Davis with poison wouldnt dare think twice if it were you. It could be you, or somebody you know or love. The fact that its anybody, guilty or not is the problem. I hope you'll keep talking/tweeting till something happens. I pray that Troy & his family see & feel that many..MANY are keeping his name and story alive in hopes of keeping him in the same way. Or if social media is your thing.. use it! Every little bit helps. I am saddened.... God Bless Him.